Judging solely by the title you might think this is about Christmas or a similar special event. Well, it is about a special event but has almost nothing to do with Christmas. More on the Christmas part later. This is Crim week, the week prior to the fourth Saturday of August. The Crim 10 Mile road race is one of the best, if not the best 10 Mile road race in the US. It began back in 1977 and while I was working as a young architect in Flint at the time, I was not aware of the race. Back in 77 the race occurred 5 weeks before my wedding day so I had other things on my mind the summer of 77 besides running a grueling 10 miles in the afternoon sun. It has been 30 years now since I first ran Crim and this will be my 27th Crim race. Only a few more and I can join the truly elite runners who also have run 30 Crims and get a 10 minute head start on the field of over 10,000 runners. So what makes it so special for me? Easy, it’s always been sort of a homecoming. It’s the area where my running career began as a high school runner in track and later cross country for Grand Blanc. Not long after that first Crim, I relocated from the Flint area to Metro Detroit where I continued to run primarily for fitness, not for competition. My passion to run long distances along rural roads or race along the curve of a flat track remained in my blood. Then late in 1983 I hooked up with a group of like-minded runners in the form of The Novi Trackers and I suppose you can say the rest is history. I ran my first Crim race in 1984 wearing cotton gear and my very expensive $36 running shoes. Back then the race started away from the finish area downtown Flint. It started on the campus of Mott Community College. There were no timing chips, no corrals, no wave, just the national anthem and the gun. Runners lined up as close to the start as possible and dared to run across dangerous curbs and damp lawns to get as fast as start as possible. I vividly remember standing in the crowded start, wondering if I would even finish a 10 mile race my longest race distance was only 4 miles. I just wanted to survive, literally! It was only about 18 months prior that my father passed away from a heart attack in a room of St. Joe’s Hospital that overlooked the start of the Crim course. I looked to that window and asked him to overlook my race. 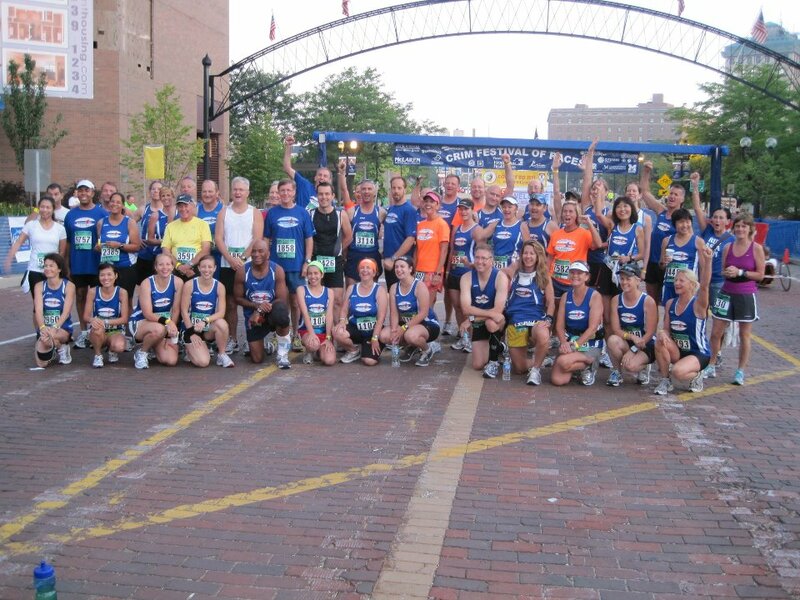 A few years later the start was moved to downtown Flint and the crowd of runners grew from 2,000 to 5,000, to now over 10,000 for the 10 Mile race. 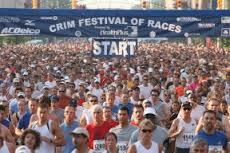 They also now have several other races and events that spread over several days, and there is a full time staff to administer the good work of the Crim Foundation. The first is the Saturday afternoon nap! It’s tough for me to get a good night’s sleep prior to any distance race so by the time it’s over, I am dog tired and need to recover. I have also always waked very early on Crim race morning, typically awake by 4AM. I get dressed, have a pre-race breakfast then drive up to Flint (about an hour north) and arrive just as others begin to arrive to downtown Flint, including the sun! It’s a dark ride and I enjoy my running tunes while munching on energy food or playing chauffeur to some of my running friends also racing 10 miles. Then it’s to a parking space, which has varied over the years but seldom beyond a 100 ft radius. For the past 20 years or so I drive up to Flint late Friday afternoon to visit the race expo. Pick up my race bib, T-shirt, goody bag, and scope out the Expo. Until 2 years ago the Crim also had a vast array of Crim related merchandise for sale. Posters, hoodies, polo shirts, even chairs and umbrellas. But my favorite has always been the coffee mugs. I must have nearly every coffee mug sold for the past 20 years. Always tastefully designed with the creative artwork by a local artist. Unfortunately this sales area no longer exists. Apparently the Crim Foundation has instead delegated the sales of such items to a major running gear company, not happy. For many years my pre-race tradition on race morning has been to simply sit on the steps of the Citizens Bank Building which fronts the starting area and simply people watch. I have met people there that morning that I have not seen in decades! The race itself has many numerous traditions, the weather conditions, the start, the course, the entertainment, and the finish line. Perhaps the best feature of the Crim finish are the frozen popsicles and cold wet paper towels racers receive after running a grueling 10 miles in hot, humid, hilly, and sunny conditions. Forget the cool heavy weighted finisher’s medal it’s all about the popsicles and other post race goodies at the finish line. In early August several years ago I was inspired to sit down and type out a mile by mile description of how to race the Crim course. I titled it “Touring The Crim Course”. It’s a stride by stride of how to strategically race the course and provide a preview of what to expect along the way. I re-issue this 8 page article with update. Ironically, I found my own description very helpful to me during the Crim races since. Post finish line has its own separate traditions. It begins with lining up with other race finishers to receive a hot slice of pizza and a cold beer. Yes it’s probably only about 10AM but this is one morning this combo works. Just a few feet away from the end of the pizza and beer line tent is a drive way to the parking lot. I have been arranging to meet people at this point for years. Usually people from years ago. It’s also a great spot to simply sit and people watch even after the pizza and beer are long gone. Up until about 8 years ago that would have been the end of my Crim race day. For the past 8 years I have been a part of the Running Fit 501 Marathon Training group. Each summer we have 50-80 runners race the Crim. Each year we also form some form of team and compete in the Crim Race Team event or our own event. It has always been a fun post race party regardless of how well one raced that day. Ultimately it’s back home for that well deserved nap but that’s not the end of the Crim race day tradition! Up until about 4-6 years ago, you could relive that morning’s race on TV. The local Flint public TV station had perhaps the best race coverage of any race on TV anywhere, yes even including word class events such as the Olympics! 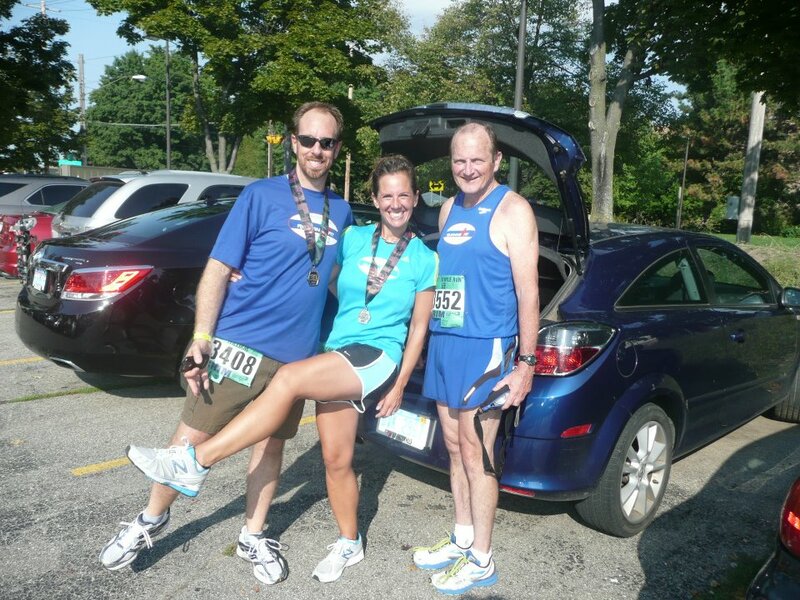 WFUM’s team did an excellent job of not only covering the leaders and elites but also the common runners too. They would regularly cut away from the elite coverage and show the middle of the pack runners in live time. I remember seeing myself struggle up the Bradley Hills at the 5 mile mark one year. That shot taught me to look up when running uphill! The TV coverage is long gone only to be replaced by same day results on the web and many YouTube videos. It’s a different world. Other ancillary traditions include stopping at my mother’s house in Grand Blanc either the night before the race or post race on my return home. The last such visit was in 2004 as she passed from this life 10 months later. My sister who lives in Flint also sends me the pre and post race clippings from the Flint Journal. I still have many of those old clippings. Good thing because the Flint Journal is also a victim of the digital age. 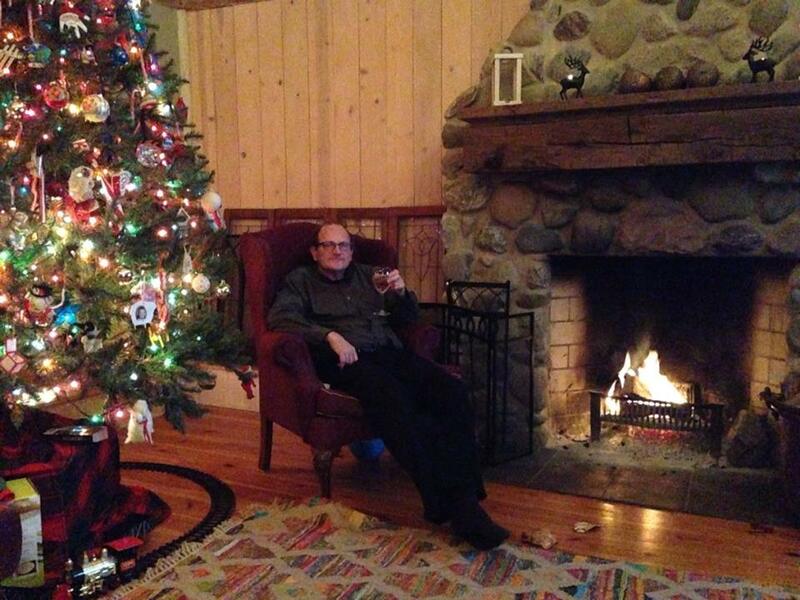 So, what about that Christmas tradition I mentioned at the start of this lengthy post? Well, I suppose you could say the Crim race extends to the Christmas season in our house too. For the past 6 Christmases I decorate our tree with race medals from that year and medals from my most memorable races from prior years. So adoring the Christmas tree with my medals from the New York City, Boston, Detroit, and Raleigh, Marathons are many Crim medals from the current year and many years prior. Thanks for taking the time to read this lengthy piece. By the time this gets posted I will be heading up to Flint to perhaps start a new tradition by competing in this year’s USATF, Masters 1 Mile National Championship Race.